While there were many ships in bottles made by Prisoner of War soldiers in World War II, and far more claimed to have been made by a POW without a shred of evidence, it is indeed rare to find one which is signed or identified as being made by a World War II POW. 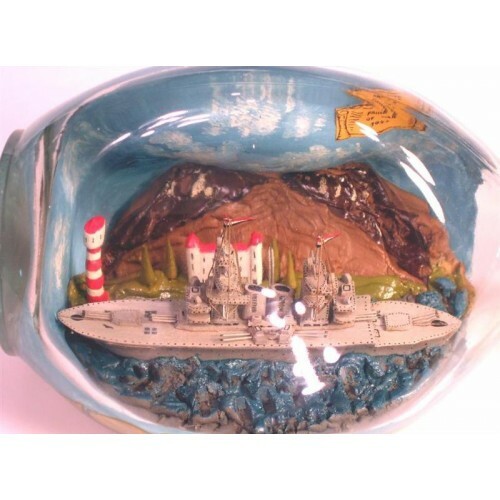 This wonderfully accurate model of the "Deutschland" cruiser, referred to as "Pocket Battleships” is one of those rare documented ships in bottles. Inside the sealed bottle is a yellow label glued in the sky area that states: "Prisoner of War" and "1947." 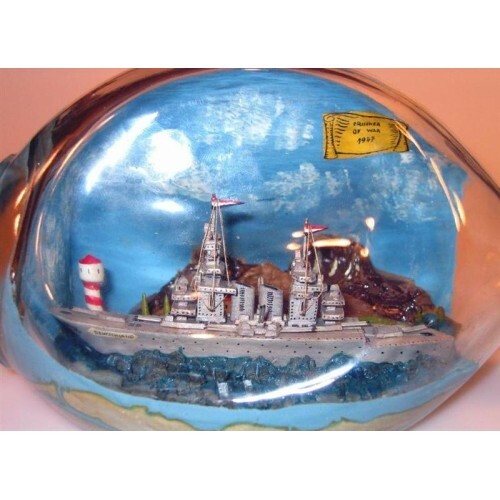 The ship is correctly painted in the WWII gray scheme and is amazingly detailed with multiple decks with countless portholes and markings on all levels. There are two main towers with rigging and a banner in red, white, and blue flying from the top of each tower. Between the towers are two large and identical smokestacks with slanted tops. The bow and the stern of the deck have two identical heavy guns with three barrels on each gun. On the port and starboard sides of the ship and amidships are three more guns with two barrels on each side. The ship has the name "Deutschland" on the bow of the ship and there is an anchor and chain drawn on the bow. The ship is on choppy waters outside a land mass with large mountains in the background. There is a large building painted white with a red roof on the land with a tower on each end of the building. There are four wood trees painted green, and a red and white striped lighthouse on the end of the land near water’s edge. 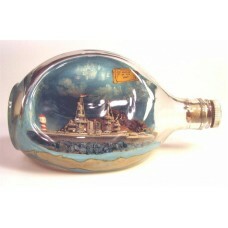 The back of the bottle is painted blue with white clouds. The bottle is sealed with a cork wrapped in a piece of paper and a metal cap. The Deutschland class was a series of three Panzerschiffe ("armored ships"), a form of heavily armed cruiser, built by the German Reichsmarine more or less in accordance with restrictions imposed by the Treaty of Versailles. The class is named after the first ship of this class to be completed (the Deutschland). She and her sister ships, the Admiral Scheer and the Admiral Graf Spee, were all launched between 1931 and 1934 and served in Germany's Kriegsmarine during World War II. The British began referring to the vessels as pocket battleships ("a battleship that fits into a pocket"), in reference to the heavy firepower of the relatively small vessels; they were considerably smaller than battleships and battle cruisers, and although their displacement was that of a heavy cruiser, they were armed with guns larger than the heavy cruisers of other nations. Deutschland class ships continue to be called pocket battleships in some circles. It was made by a prisoner of war who worked as a coalman near a village, called Pateley Bridge, North Yorkshire. Approx. Bottle Size 8" x 4 1/2"